What a difference a day makes (another bad song, Sue) …. Yesterday Hayle was a dull, fairly miserable place whereas today it boasted a beach and bay that could rival the Caribbean! Well, you know what I mean. My boots and every part of me were dry and the morning sunshine was warm and bright and very welcome. 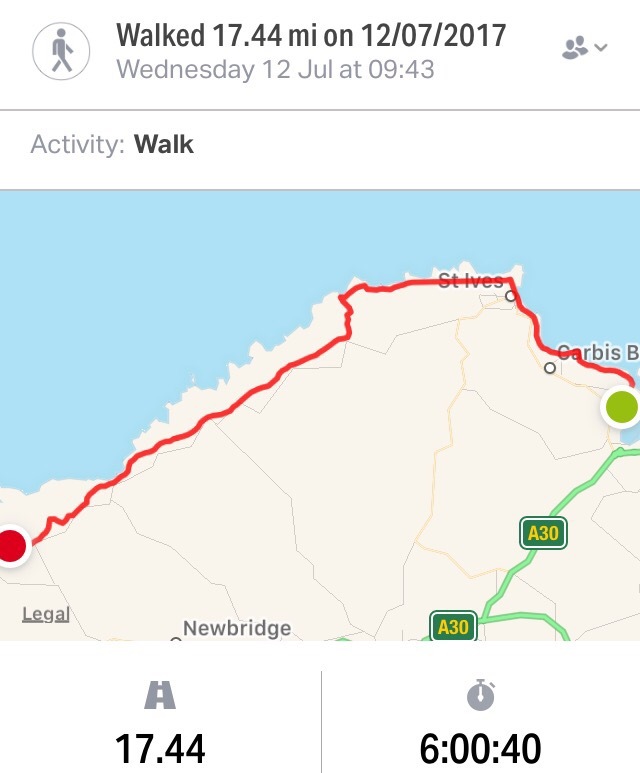 I crossed a golf course and then followed the path, squeezed between the St Ives train line and the beach, towards Carbis Bay. No riff-raff in Carbis Bay – I walked past the lovely bay (with a major development under construction) and striking houses with even more striking views, and echiums (or echia?!) growing like weeds along the path. A bit further on, St Ives looked invitingly glorious, but it was too early to stop and I cut through the town via the Tate gallery. The town’s streets and beaches were busy, arty and smart. The crowds soon fell away as I followed the path westward – lots of rocky clambering. After the towns of Hayle, Carbis Bay and St Ives the coast is quickly devoid of any settlements as far as Sennen and Land’s End. I came off the coastal path to head inland through fields towards Zennor for lunch. The Tinners Arms is a favourite of the FatBlokes and ‘something we always do‘, and I enjoyed mussels and a pint of Tinners. I lost my way as I rejoined the coastal path after The Tinners and found myself scrambling upwards at Portmoina Cove to join some climbers (who I thought were on the path, but in fact were regrouping from an ascent). They gave me a cup of tea and explained what they’d been doing to reach the top of a sheer rock face. See if you can spot the climbers on the opposite face, Bosigran Cliff …. In a brewing Pythonesque moment I took this photo of a climber …., who was taking a photo of a climber …., who was taking a photo of a climber. I don’t know if anyone was taking a photo of me, but I’m not a climber so I don’t know if it would have counted anyway…. I arrived in Pendeen – again a bit inland – and dropped into the North Inn for an emergency lager. The FatBlokesWalking have stayed here a couple of times and on the last occasion some of us came away with bedbugs, so I tried the other pub in the village for dinner – my last ‘billy-no-mates wearing odd clothes’ evening for a while, I guess …. Land’s End – adventure’s end – is tomorrow. Blimey! Have a brilliant day and enjoy the final countdown. Looks like the weather gods are smiling on you for the last time. What an amazing shade of blue the sky is in these pics. Anyway Christo, have a really fab final push. And don’t even think about the next one! Hope today you thoroughly enjoy! Such an achievement Chris! Walk like an Egyptian , Anything by the Walker Bros etc and don’t worry Chris you will always be ” Billy-no-Mates wearing odd clothes ” to me buddy . Relish your last 20,000 steps and see you tomorrow night , dressed like a baboon as always . I am somewhat thrown by the image of Jos dressed as a baboon. Does that mean he will be wearing bottomless trousers! All I can say is you are on The Final countdown and your Boots are made for walking so chin up and realise you are not on The Highway to Hell, rather the Stairway to Heaven. I would have thought sitting by yourself was second nature to you anyway. I fear you will struggle more with no longer walking on the beaches looking at all the peaches. Good luck tomorrow….with true Olympian spirit, I suggest you might run the last 20 miles ?! Anything off the Rubber Soul album might be an appropriate nod to your boots. Sorry I can’t be there either at LE or Mike’s do (Happy Birthday,Mike !) but will raise a glass by the pool in celebration.